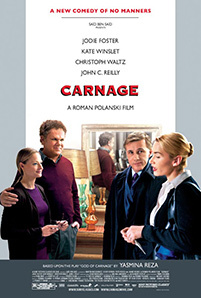 Domestic Movie Trailer for Roman Polanski’s Carnage. Jodie Foster, Kate Winslet, Christoph Waltz and John C. Reilly star in the dark comedy based on the play ‘God of Carnage’ by Yasmina Reza. Shot in real time as four adults meet to discuss their sons’ involvement in a schoolyard fight. The meeting quickly becomes an argument between power couple Nancy (Winslet) and Alan Cowan (Waltz) against the liberal writer and campaigner Penelope Longstreet (Foster) and her wholesaler husband, Michael (Reilly). Running Time: 1 hr. 19 min. After two boys duke it out on a playground, the parents of the “victim” invite the parents of the “bully” over to work out their issues. A polite discussion of child rearing soon escalates into verbal warfare, with all four parents revealing their true colors. None of them will escape the carnage.